Mariachi is more than just music—it is symbolic of Mexican music and culture encompassing centuries of tradition. 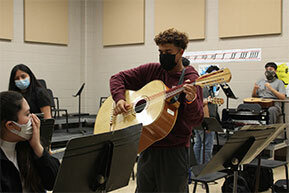 It is with honor and pride that West Oso High School carries forward the celebratory customs of the mariachi. Mariachi Oso is a high performance sharp group of students who showcase their talents around the campus and within the community. Up to 24 performers costumed in traditional charro suits dazzle audiences with a repertoire of folk-derived music, polka, and waltz tunes. Instrumentation includes violins, a trumpet, a guitarron, a vihuela, guitar, and vocals.